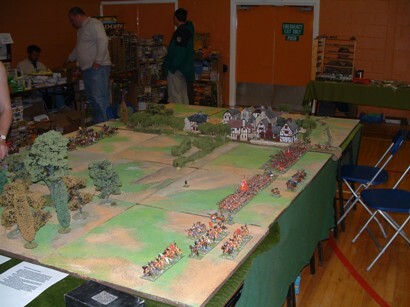 This Scenario was fought out by members of my Wargames group some years ago and appeared on the original Old Glory UK Website. The Rule set used was Forlorn Hope but the organisations were mine reflecting a much lower figure to man ratio than normal. The table area was 10 feet by 6. All the figures were manufactured by OLD GLORY from their 25mm ECW range, mostly from my personal collection but with some from the collections of Rob Anderson and Dave Huntley of the Border Reivers Wargames Society Players were Jim Main as the Royalist Commander and Jeff Awdas as the Redoubtable Roundhead!!. The Following tables give the unit strengths and abilities as well as the objectives for the rival forces. All the photographs were taken by my late father Brian Copestake who was never a Wargamer though he did soldier in full size as a Rifleman in the Royal Green Jackets - now the Rifles. The Rebells have seized ye Royalle towne of Ambridge in ye countie of Rutshire. They must be sent from hence as soone as maibee. A Saker ARTILLERY TRAINED N/A 1 medium gun & 4crew. Prince Rupert of Ye Rhine Ld Generall lv2. Ye will deploy on ye North edge of Ye table NOTT more than a round foote from ye edge. Nor yet nott less than 4 feete from ye Eastern edge. And May God Have Mercy upon Ye for Ye UMPIRE shall nott. For God and Parliament!! The Yr of our LORD 1643 MAY. 21st. Ye malignants advance against oure faire towne where they wille doubtlesse despoil oure women and PILLAGE OURE PROPERTY!. If yt please ye almighty wee shalle prevaile. They are mightier in horse than wee but oure Foote are better menne. As Lord General of the Forces of ye Rutshire Association yt is your task to engage ye malignants on the edges of ye towne of Ambridge and prevent them from gaining entry. Ye may Deploy any where behind ye center lyne of Ye table but notte within a foote of yt. And May Ye Lord of Hosts have Mercy upon you for the Umpire shall not!!. The Armies for this scenario totalled something over 4000 men at our 1 to 10 figure ratio. Units on both sides are larger in terms of figures than is usual these days. This is simply because larger units behave more accurately than the tiny “dancing infantry” units one so often sees on the table DBR- BAH!! HUMBUG!!. Larger units have REAL flanks and cannot dance around like the 10-20 figure units most often encountered. Players get to use their brains instead of the rulebook…..
As mentioned previously the playing are was 10 feet by 6. The Parliamentarian left flank was covered by the town of Ambridge, occupied by the Dragoons, on the right “Archers Woods” provided a barrier to the superior Royalist horse- or so the Roundheads hoped. They signally failed to occupy these woods. This omission was to have serious consequences. 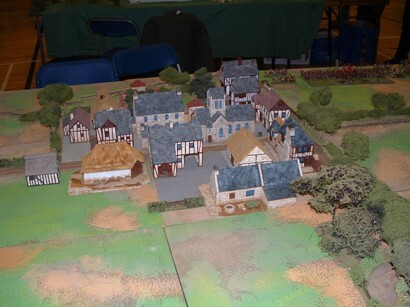 Picture 1 The Town of Ambridge from the Royalist side of the Table- photo by Brian Copestake – My Dad who is not a Wargamer at all!. Picture 2 A view of the Roundhead Army- Archers Woods in front of the Roundhead Horse Photo by Brian Copestake. The action began with a thrust from the Royalist horse through Archers Woods. The Roundhead Cavalry Moved to counter hoping to catch the Royalists in a disordered state as they emerged. However things did not go to plan after a prolonged and often vicious cavalry fight the Roundheads were beaten. However the blown Royalist horse could not immediately exploit the situation. 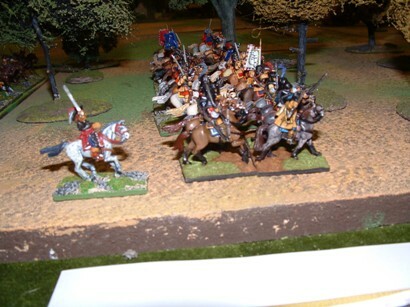 Picture 3 The Royalist Horse advance through Archers Woods photo by Brian Copestake. Mean while in the centre the Royalist foot were simply not getting on with their job. They seemed to be intimidated by the units of Roundhead foot opposing them. The Royalist advance was, at best, tentative. They never even looked like coming to grips with the Parliamentarians. To complete their discomfiture a sally by a company of Wardlaws Dragoons from Ambridge captured and spiked the Royalist gun. 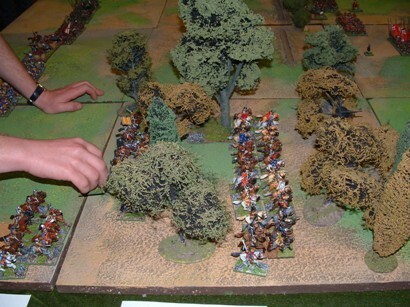 Picture 4 Another view of the Royalist advance through the woods.. Photo by Brian Copestake.- Hand by Jim Main!! As the day drew to a close the Parliamentarian infantry were untouched and defiant. Their Cavalry defeated. The Royalists had become hesitant and confused, despite their battlefield success they did not feel confident about an all out assault on the Roundhead foot, who, as night fell (move24) retired sullenly into Ambridge. The following paragraph gives a small idea about our wargames group and its attitudes- interested parties should contact me, Andy Copestake through the website. We are a small informal group formed – or perhaps congealed- about 12 years ago to play almost exclusively Historical games. In our time we have played most periods to various sets of rules. We play “to period” rather than “to game” by which we feel free to mangle, change or mutilate any set of rules to meet our needs and our view of history..
All our games are umpire controlled- each member taking it in turns to run the game at a meeting. He, of course, choosing the period, rule set, scale etc.. This means that we play many periods. Ancient, ECW, ACW- both land and Naval- 7 years War, AWI and Colonial and that’s just this Year!! Not forgetting WW1 and WW2 Naval. We are probably the most relaxed and non-competitive group in the country. Rules lawyers get short shrift – we considered burning at the stake but the W.I. who own the Hall were worried about the carpet!! That’s about it really there’s not much more to tell- getting a relaxed game in a historical context- or sometimes not- is what its all about. Oh and having a pint or three afterwards….. So if you fancy becoming a T.W.A.T. drop me an email or give me a call. A fine sense of the ridiculous is a pre-requisite as is a sense of humour. A decent collection of figures will help but is not essential. We tend to meet on Thursday evenings with occasional Big Games on Saturday. Picture 5 One of the large Parliamentarian Foote regiments which so disconcerted the Royalist Commander. Picture by Brian Copestake. All the pictures were taken “live” at the old Stockton show in 2004 by my Dad a few years before he died.